If you’ll ask any car lover about ‘Active Tourer’ the first name from automobile industry he’ll take, will be Mercedes Benz. Company started it back in 2011, named as Mercedes-Benz B-Class 2015. The same series holds our discussion for the day through its recent release Mercedes-Benz B-Class 2015. Fully loaded with features, world class upholstery and sizzling performance, this all new unveil undoubtedly deserves to be the heartthrob. Let us have a look at the Mercedes Benz B Class 2015 review and get to know it better. The interior of Mercedes Benz B Class 2015 is equipped with high quality materials that make the cabin luxurious and serene. Sitting amidst 12 colors ambient lighting system the eight-inch free standing head display unit provides you clear surveillance over command system through its better resolution. Behind the three-spoke multifunction steering wheel the newly designed instrument cluster adds fabulous through its new dial layout. Apart from comfort, elegance and superiority, the Mercedes Benz B Class 2015 interior brings some options as a treat for its buyers. List begins with the 12 colors ambient lighting we mentioned above, this allows you to set your arena as per your mood. Seconds one brings innovation and command through Keyless GO. This feature allows you to open and start your car with the electronic key in your pocket. 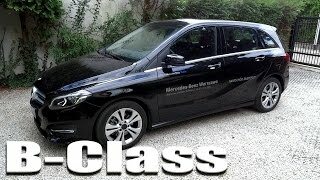 The exterior of Mercedes Benz B Class 2015 might not look as classy as other models from the house but it undoubtedly splatters the glory one expects from Mercedes. Starting with the front fascia of Mercedes Benz B Class you’ll notice redesigned bumper carrying more aggressiveness in comparison to the predecessors. Above it sits the entirely new headlamps with integrated daytime running lights. Scheduled to knock the street in three new designs namely, Style, Urban, and AMG line the exterior of Mercedes Benz B Class 2015 doesn’t brings much of changes. However there is one thing in all we can assure and that’s luxury and reliability when you look at the exterior of Mercedes Benz B Class 2015. 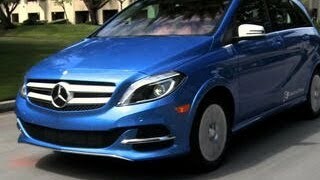 The Mercedes Benz B Class 2015 models bring under their hood powertrains to satisfy each buyer. The sequence begins with a 1.5 Liter four cylinder engine which cranks total output of 109 hp and peak torque of 260 nm. Second engine I lineup is a 2.0 Liter four-cylinder generating total output of 136 hp and peak torque of 300 nm while the last one is again a 2.0 liter four-cylinder but throbbing total output of 177 hp and peak torque of 350 nm. The models thus are capable of touching the 0-62mph in 11.6 seconds, 9.9 seconds and 8.3 seconds respectively. Each of them comes paired with a 7G-DCT transmission as standard. As far as top speed of Mercedes Benz B Class 2015 is concerned, models can take the figures to whooping 117 mph, 130 mph and 139 mph respectively.